Laser treatment for acne scars is a common procedure performed in a skin and beauty clinic or dermatologist’s office. The appearance of acne scars on the skin will be disturbing and can reduce confidence. By using this treatment, acne scars can be significantly reduced or even completely erased. However, this depends on the severity level. 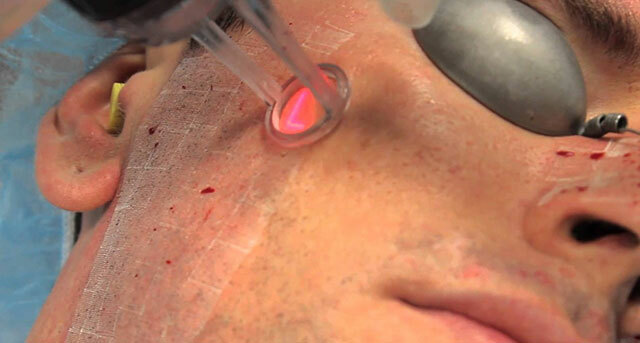 Basically, it works by using a laser to destroy the outer skin layer called epidermis. It works by making cuts or inflammation in the skin with the help of a laser beam. The laser beam will kill acne bacteria on the skin. Irradiation does not perform only once, it can be 2 to 3 times to clean the acne scars. The success can be up to 100% effective. In fact, they include other treatments to nourish the skin. It does not cause pain. Using laser treatment for acne scars will not cause pain or discomfort unless the acne is more severe. The laser light works quickly and precisely in the center of the problem. It only takes a relatively short time to undergo this treatment and takes only several times for the treatment schedule. The difference will be apparent in just a few treatments. By the time you do the treatment, the bacteria that cause acne are also destroyed. This causes acne does not appear again and, of course, there will be no more stubborn acne scars. By using laser treatment, the sebum production in your face as the primary cause of acne will decrease. Although it is fast and has some benefits, this method is not without risk. There are some unpleasant side effects in case of treatment failure. Post-treatment pain is not a big deal comparing to the pain you experienced during the actual skin laser procedures. Topical anesthesia is typically applied prior to treatment to minimize the pain as much as possible. Nevertheless, you will still feel discomfort after the procedure and the doctor may prescribe pain pills for more invasive skin treatments. It would also be painful to wait for your skin to recover. This is a common side effect of laser treatment for acne scars. It will physically vaporize the top layer of your skin so it will cause redness, swelling, and itching. These symptoms will subside after a few days although it will leave “pink” skin for weeks afterwards. For the success of this treatment, there are rules that must be obeyed by the patient. After the irradiation process is done, the patient should not be exposed to direct sunlight in order to avoid infection. There is another opinion which says that such a rule could be circumvented by using anti-sun cream. However, it is also still being studied by experts, the effect that would occur if the patient uses the anti-sun cream after the treatment. When the treatment process takes place, the perceived effect is only slight burning sensation on the skin. However, the actual sacrifice happens during the recovery period. For certain types of skin, the skin will feel very dry after getting the laser beam. But you do not have to worry, your dermatologist will give you face cream to support the recovery process and make it more secure. Besides having to deal with the risks and side effects above, laser skin procedures are also more expensive than other treatments. You may feel disappointed after spending thousands of dollars for laser treatment if your expectations are not realistic. Therefore, make sure you are knowledgeable and consult with a dermatologist to get the best laser treatment for acne scars.